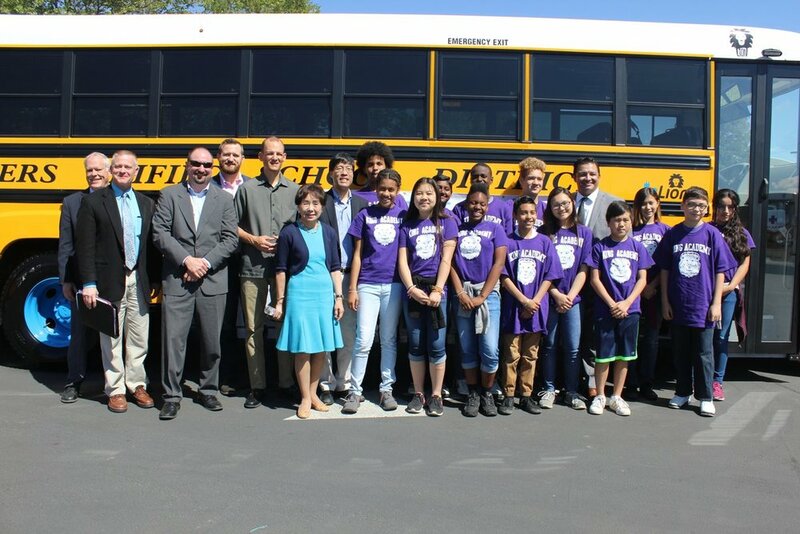 SACRAMENTO – The Sacramento Metropolitan Air Quality Management District (AQMD) and its partners today unveiled the largest electric school bus deployment in the United States. Twenty-nine new electric school buses will serve students throughout Sacramento County. The buses’ routes run primarily through disadvantaged communities, reducing air pollution from diesel exhaust in these neighborhoods and helping to protect children’s health. Twin Rivers Unified’s electric fleet is currently in operation. Electric buses will begin operation in Sacramento City Unified and Elk Grove Unified in the coming months. The California Air Resources Board (CARB) provided $7.5 million in competitive grant funding to help pay for the project. CARB offered the grant through California Climate Investments, a statewide program that puts billions of cap-and-trade dollars to work reducing greenhouse gas emissions, strengthening the economy and improving public health and the environment — particularly in disadvantaged communities. The project partners contributed a combination of cash and in-kind matching funds totaling $6.9 million. Valuable partners on the project include First Priority GreenFleet, Motiv Power Systems, EV Connect, California Strategies, the Sacramento Municipal Utility District (SMUD), Phil Haupt Electric, Lion Bus, Trans Tech and Kisensum.